Thank you for visiting Salsa Divina website!!!
" I feel blessed for being touched by the "healthy Salsa Virus"! And the time has finally come to spread this "infectious" addiction with you all. Come to learn the secret of the magic elixir to a longer, radiant life. You will not only learn about musicality and cool moves but also you will learn a new life style that will put a permanent smile on your face! This is what Salsa (Social Dancing) has done for me and for many other people! It has helped me become a much happier, more outgoing, fearless, anxiety and stress free person." Divina De Rose, Italian living in London and Founder and CEO of Salsa Divina based in Stratford London. ​Divina is well known in the Salsa world for her deep passion for Salsa and what goes with it. Her passion led her 6 years ago, soon after returning from her first trip to Cuba, to gain a professional BTEC (Level 1 & 2) Qualification as a Salsa Teacher and the SAL Certification as a Kizomba teacher so that she could help others to learn this amazing dances and to live a happier and healthier life! Divina was so eager to learn to teach people to dance that she attended both Level I and 2 at the same time and passed her exams with “Distinction”. Divina has been teaching many people in various format and in different Latin dances since then (group classes, one to one and Wedding Dances). Moreover, this very passion took her to Cuba 6 times to discover, learn, live, breath and feel the roots of Salsa and other Afro Cuban dances!! And she must have assimilated well considering that when Cubans see her dancing they think she is Cuban too.... ah ah ah!!! ... And wow! What an amazing experience Cuba must have been!! Her first trip to Cuba has totally changed her life! Divina is extremely thrilled at the idea of sharing her passion and knowledge of the most popular social partner dance in the world.... Salsa and all the other Social dances associated with it (Merengue, Bachata, Reggaeton and now also Kizomba (the African Tango!! ) and she has recently added Swing to her syllabus too. Started dancing at an early age in West Africa, in Sao Tome e Principe, where music and dance are strongly part of their culture. When he was he 15 joined the local dance group called Funk Dance which used to perform both the traditional and the trendiest local dances. 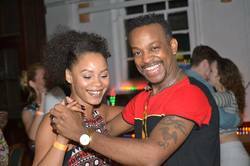 Rangel then moved to Luanda, Angola, where he had the opportunity to practice and improve greatly his Kizomba dancing and where his teaching experience started. He then finally came to London 15 years ago where he discovered Salsa and the other Latin dances. His passion for these dances led him to gain the BTEC Level 1 Qualification in Salsa Teacher Training. And the SAL Certification as a Kizomba teacher which helped him to re-adapt his teaching style and technique to suit a more European audience.